In warm-up to head-tax bout, Seattle business owners ask council: What have you done with the money you have? Some call it a “tax on jobs.” Some call it a “tax on Amazon.” Draft legislation has yet to emerge, but business owners and progressive activists aren’t waiting to ratchet up their rhetoric. Draft legislation has yet to emerge as the Seattle City Council considers a new tax on large companies to raise money for affordable housing and homeless services. But business owners and progressive activists aren’t waiting to ratchet up their rhetoric as they jockey for public opinion and lobby council members, some of whom will discuss the matter Wednesday. A final vote could come in May. Major bucks hang in the balance, because a task force set up by the council has recommended options for a tax on employees or payroll that would raise $75 million a year. More than 180 business leaders — including the president of the Seattle Metropolitan Chamber of Commerce, which boycotted the task force — signed a letter Tuesday urging the council to reject a tax they don’t want to pay. “We believe the false narrative that business is paying less than its share, coupled with a rushed process with a predetermined outcome, resulted in the tax force’s current recommendation,” they wrote, saying taxes paid by companies make up 57 percent of Seattle’s general fund. Despite record revenues and budget bumps, homelessness has grown in recent years, the business leaders said, accusing the city of squandering taxpayer generosity. “The ineffectiveness of the city’s approach to homelessness is on display on our streets and sidewalks,” they said in the letter, preceded by an email from Chamber President Marilyn Strickland telling her members to pressure the council. Earlier this month, about 300 small businesses sent a letter voicing worries. Proponents of a so-called head tax agree the homeless situation is shameful. But they say a shortage of inexpensive housing — not City Hall — is responsible for the problem, and they want business powering Seattle’s boom to help more. The city’s tools for generating revenue are limited by state law, and Seattle had a head tax before, the backers say. To rally support, Councilmember Kshama Sawant planned to host a “Tax Amazon Town Hall” at the Langston Hughes Performing Arts Institute Tuesday night. “As Trump and the Republicans give a $1.3 trillion tax cut windfall for big business, Seattle’s affordable housing and homelessness crisis rages on,” her office said on a Facebook page promoting the event endorsed by the council member’s Socialist Alternative Party and Seattle’s Democratic Socialists of America chapter. Sawant is calling for a tax that would yield $150 million annually, saying that money would build 750 affordable apartments and add $30 million in services each year. Targeting Amazon may make political sense, with CEO Jeff Bezos recently becoming the richest person in the world. Less clear is exactly how many other companies a new tax would affect, and how. Rather than set a proposal in stone, the task force recommended various options, suggesting the tax could target companies with gross revenues over $10 million, $8 million or $5 million annually. Those businesses could pay a sum for each employee or a percentage of their payroll, and the council could choose to ask some smaller businesses to pay a nominal amount, such as $200 total a year. The smallest businesses, with gross revenues under $500,000 annually, could pay nothing. Under one option, companies covered by the tax would pay either $200 or $450 per employee per year. 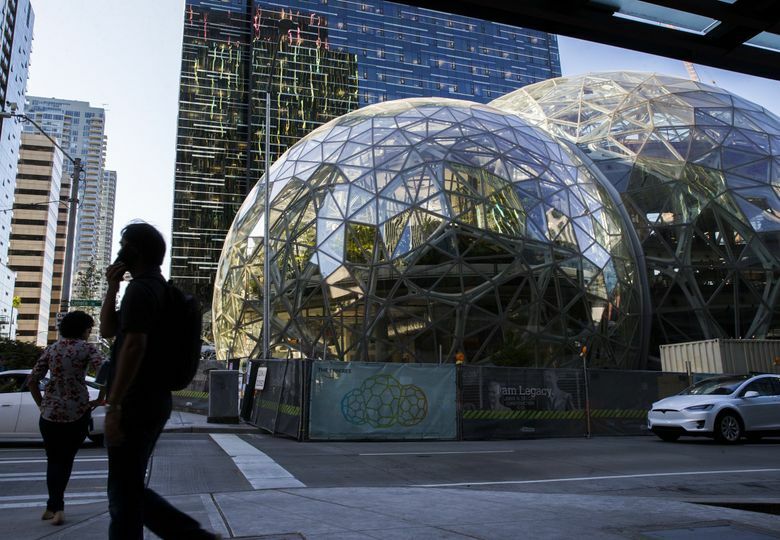 Paying $450 for each of its about 45,000 Seattle employees, Amazon — which posted a $1.9 billion profit in the last quarter of 2017 — would owe $20.25 million. “There are a lot of moving dials,” Herbold said, promising a business roundtable and other opportunities for widespread input before concrete legislation is proposed. The council last considered a head tax in November, voting 5-4 to narrowly reject a version that would have raised $25 million a year and vowing to try again. Looming over the debate is Mayor Jenny Durkan, who since last year has withheld support for a head tax, expressing concerns about small businesses. Seattle’s previous head tax helped pay for transportation projects, but the council repealed it in 2009. Herbold said the possibility of a mayoral veto “is always a thought in the back of a policymaker’s mind when trying to do something big.” But consensus is the goal. “We’re still early in our deliberations,” the council member said. Separate from the council’s deliberations, the mayor and King County Executive Dow Constantine are leading a regional work group on homelessness. Dubbed One Table, the group could in the coming months recommend government reforms in addition to or instead of new taxes.